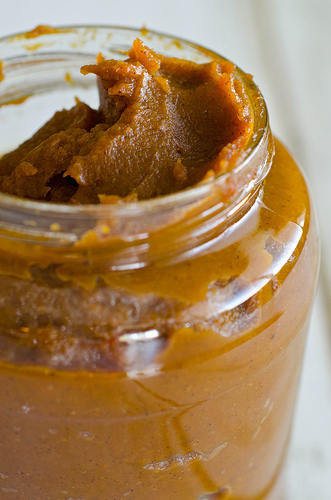 Homemade pumpkin butter is extremely easy to whip up on your stove. It is also extremely easy to put to good use. 🙂 Spread it on toast and waffles, or package it up for a gift from your kitchen. Some people even mix it with yogurt or cottage cheese for a nutritious snack. Combine all ingredients, except the lemon juice, in a large saucepan. Bring to a boil, then reduce to and simmer, stirring often, for 40 to 50 minutes. The mixture should be thick enough so that when you run your spoon through it will not close back up. Remove from the heat and stir in the lemon juice. Let cool to room temperature. 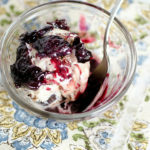 Pack into storage containers and refrigerate for up to a month. 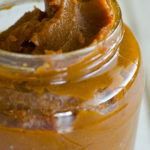 Pumpkin butter can also be frozen for up to 6 months. Pumpkin butter is so ultimate. My girlfriend sent me a couple of jars from Williams Sonoma a couple of years ago, and I adore the stuff. Can’t wait to make my own! So awesome you only need a 28 oz can too. Thanks for sharing, Nikki! So, can I use pumpkins from my garden? You mentioned not to use pie filling…is that like Libby’s? What is the difference? I know crazy questions, but I really would like to try this recipe, it sounds WONDERFUL! THIS is sooo yummy!! 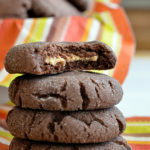 made it this morning after finding this cookie recipe i wanted to try!! I cannot wait to try this! I love the pumpkin butter (or is it just pumpkin spread) from Trader Joe’s, but never thought it would be possible to make my own!!! 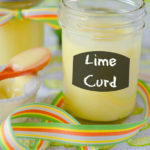 Especially good with cream cheese on crackers!